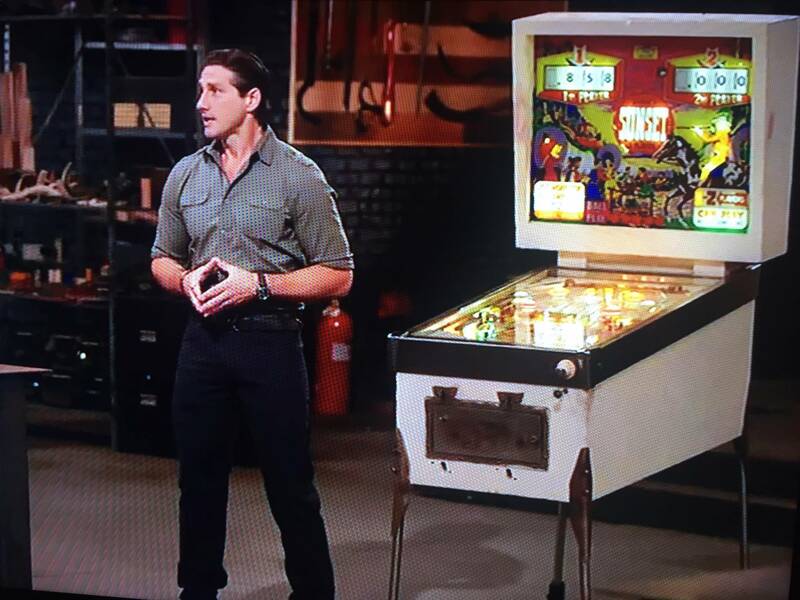 Next week on the upcoming episode of Forged in Fire, the contestants have to forge a blade out of parts harvested from a vintage pinball machine. If anyone is not familiar with this show, it is a knife making competition between 4 blacksmiths to make the best weapon possible, oftentimes out of common items like old tools, or car parts. It will be interesting to see what they will choose as usable steel to forge a blade with, taken out of a pinball machine. It will be on Wednesday 3/13/19 at 9:00 pm. Sounds badass! Love that show. You could probably forge a blade out of the balls...or maybe the legs? Should just be all the steel pieces right? And then they meld those down? That show is addictive for sure. Wednesday 3/13/19 at 9:00 pm. Sorry. Should have mentioned that. I might have guessed, what with the theme/topic of a show dealing with blacksmithing. I am thinking that a push/pull slide coin mech from a late 40s early 50s pin might make for a good decoration on the hilt. Also a pop bumper ring, as a guard for the handle. Or maybe some type of switchblade out of zipper flipper mech. I'm really surprised no one has chimed in yet, raising the pitchforks, yelling you can't destroy a pinball machine. Logically these make the most sense, due to volume of material. Not very thrilling to watch though, I would think. Sadly, to do anything more interesting would require cannibalizing smaller parts. Wanna see someone take coils and do a copper inlay into a cabinet-body plywood hilt? I'm pretty sure I've watched an episode where they used ball bearings. It is a surprisingly interesting show. Definitely going to be some canister Damascus going on. then they maybe making a Hercules sized pin to test the blades? Noticed that...They had think solid metal 'rails' on the playfield too, non if it original to the pinball. Pretty cool non the less. Never watched this before, is that the norm for this show, just shove metal parts to be used into some random device? Nope, it is a great show. Usually car springs, ect. This was an unusual gimmick. I was kind of disappointed. It was a cop-out. Machines don't have legs like that. Whats the point of using an object for metal, if you add metal to it so it can be used? I was thinking they could use coil plungers, or stuff like that. If they need to harvest metal from a lawn mower, they use the blade, or if its a bike they use the chain. On the pinball they used nothing from the actual machine. I like the show, but that's pretty lame. Perhaps they were making something large that required more "good" steel than otherwise available on a pinball machine? That's what I was thinking... they would use balls as the hard metal, and maybe use some soft metal for the spine of the blade. springs would also have been hardenable metal, but not much mass of springs in a machine. I'd have thought the balls would be fair game. At least they didn't destroy an Appollo 13 for the sake of keeping it real. Yup....love the show and I was excited to see the pinball connection, but planting usable steel around the machine was a bit of a cop out (what’s the point??). I thought they’d be fighting over the balls and maybe the lock down bar... or maybe making canister Damascus using springs and switch leaves and such. And why was the cabinet painted white? It must have been trashed, or maybe the Gtb logo was too prominent. Anyway, still enjoying this show but sadly this was not their best episode. Those barbarian swords looked pretty cool, though. Wasn’t interested enough to make it through the episode. Got boring really quick when they started using metal that wasn’t part of the game. Any time you get publicity for pinball on a popular TV show it's a good thing. Pinball needs it. 99.9% of the people watching didn't pick up on them switching leg material anyway, they probably wanted to go with the concept but realized the metal on the machine wasn't going to do the job.